Humanity needs a savior. But a rivalry between two tinkers threatens to destroy the world they're trying to free. Cadmus Errol is the greatest inventor that Tellurak has ever known. His clockwork graces the spires of cities across the world. Yet in another, darker world, he lives the life of a slave. There, humanity is held underfoot, bound in service to the victors of a war fought untold generations ago. It will take all the wits and resources of the best that humanity can muster to break that hold. 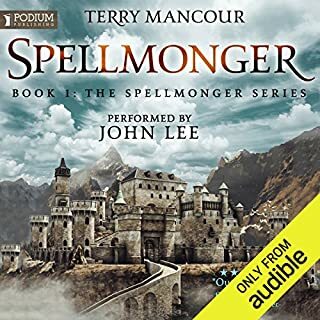 Can Cadmus Errol, the Mad Tinker, be the one to free them all? Or will his daughter take a shortcut through dangerous science to wipe out humanities oppressors? 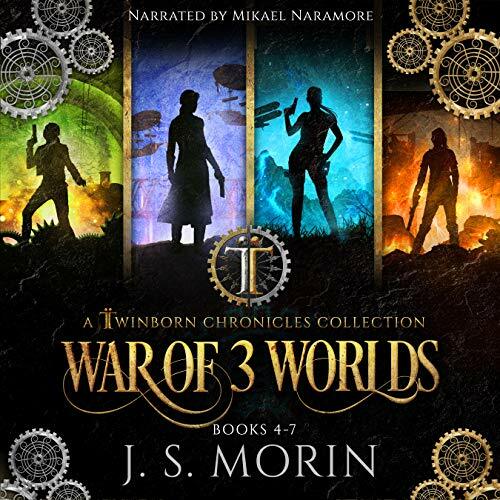 The Twinborn Chronicles: War of 3 Worlds is an epic fantasy series with multiple point of view characters. If you love steampunk gadgetry, heroes who get their hands dirty, and a DIY heroine, this series is for you! Pick up your copy of the second full collection, and discover an ally you never knew you had. War of 3 Worlds is a trilogy that runs close to 45 hours of listening time, so you are getting your money's worth to start off with, and you will find it to be well worth the time that yu put into it. I will start out warning you that this is a sprawling read. It covers three different worlds, and has a massive cast of characters that would make George R.R. Martin proud. It is filled with all kinds of goodies including tinkerers (made me think of the gnomes in Dragonlance, but withot all the DOOF! ), steampunk, warriors, worlds, and more. It seems that this is a collection of books 4-7, so I will now be looking for books 1-3!! Ok, let the praise begin. 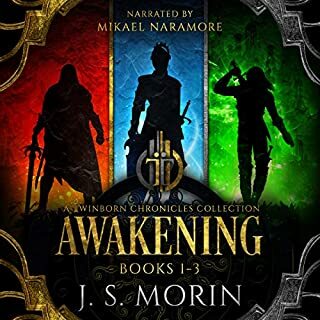 Morin has a nice style that keeps your attention, believe me, the dialogue is real, the characters utterly believable, and the plot is perfectly paced. You never have a question as to what is going on or who is speaking, and let me tell you the twists and turns are so abundant you will wnt some dramamine on hand. There is a lot of stuff you will not see coming, and then say you should have. I also appreciate a writer who isn't afraid of a little blood and gore. That being said, some indelicate types might find it a little off-putting. Still, I loved it. Mikael Naramore brings some Babe Ruth level vocal talant to the team, he is easy to listen to, and in a book with a massive cast of characters he brings each one to life. The man can set a mood with just a slight shift in his voice, and can make the action go harder and faster with a shift in inflection. Bravo! This is a great set of books, and it makes me eager to see how the whole thing started. A wonderful blend of steam punk and fantasy. It is clear that the stage is set to add SF to the mix in the next book. I will look forward to it’s release! If you are looking for a series full of characters that are not even remotely likable then this series is for you. Every character is extremely selfish; I think the main characters spent more time focusing on how to betray allies then fighting their enemies. Only the worst characters from Twinborn Chronicles play a major role in this series. The ending is pointless full of illogical betrayals that made no sense other than to create conflict. It seems like the author got bored and decided to just end the series by killing everyone. This series ending was a huge letdown. This book was a slog! It put me to sleep. Seemed like I would never get through the book. Given the name of the series you should expect a decent amount of hopping between different locations, and just like the first trilogy this one does not disappoint. the story is complex and has obviously been crafted with attention to details, both from it's own narrative and the ones that came before. I found myself enthralled by many of the side characters that presented unknowns throughout the tale. Great series! 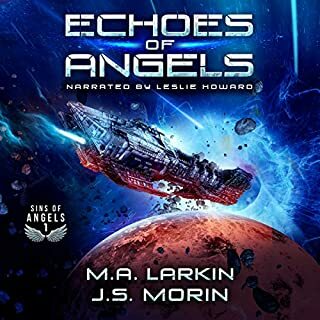 Would you consider the audio edition of Twinborn Chronicles to be better than the print version? good job on the overall but go a little to predictable the last couple of chapters after having read the other series. Not as good as the black ocean series. 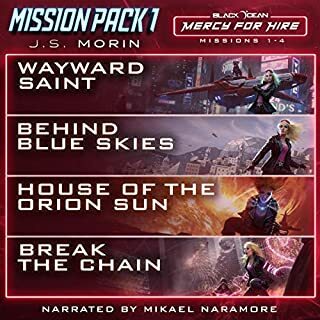 I loved the the black ocean series and assumed since this series had the same author and narrator, I would enjoy this enough to finish it. 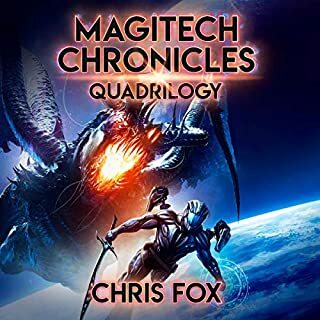 The narrator used too many of the same voices from the mobius, which is understandable but I could not keep from mixing them up. I got to half way into the 2nd book and was so bored I stopped. I didn't like the father and daughter "main characters" from ether world and so I stopped caring what happened to them. one character gets injured and I honestly did not care at all. I think they are suppose to be "grey area" good guys but are not done well and come off as just annoying jerks. I will likely finish it one day but I need to cleanse my palette before attempting. I enjoyed the first book more, but only because it was simpler. The plot threads are complicated but not tangled...just knotted tightly. It has the game of thrones unexpected death shocks and scattered story lines, but in a much more compact and accessible framework. There are many recognizable characters from the first series but make no mistake, except for small parts this stands alone extremely well. recommended. This would be a lot better if Chipmonk wasn't written as a character that's supposed to be intelligent, yet does the most ridiculously stupid crap over and over. I keep trying to get farther into book 2 but i just get pissed off by the writers tenuous (at best) grasp on military concepts, especially when the characters do something idiotic and then pretend like it wasn't the dumbest thing ever. don't waste you time on this, it really isn't worth it. As i said in my review of the 1st series of books having 2 whole worlds and characters is confusing enough now add a 3rd world to it with even more characters. while the book(s) itself is good and well written its was a bit too overwhelming and confusing. 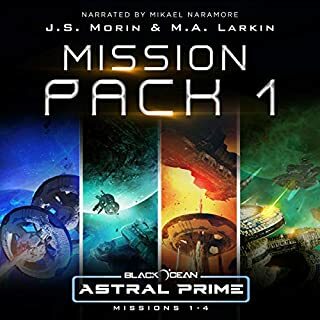 i bought this 4 book series on the basis that I listened to the entire Black Ocean series by the same author and narrator pairing and it was one of my all time favourite audiobooks. you would never know it was the same people. lacklustre story, unemotional and boring. not well delivered. wasted my credit. Great story Great narrator Great tech. J S Morin has done a terrific job. Loved it to the very end .